‘A Day in the Life of the People, Animals and their Zoonoses (PAZ) Project’, is series of blog articles by several members of ILRI staff working on the PAZ project based in Busia. 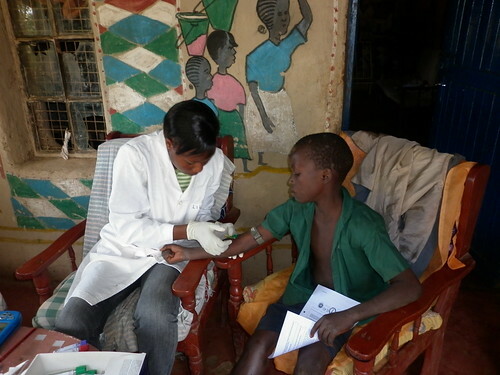 These staff members, share their first hand experiences, challenges, and highlights of the project, in this post Lorren Alumasa, a clinical technician talks about Tapeworm infestation in Busia. The People, Animals and their Zoonoses (PAZ) project study site, Busia County in western Kenya is a region where the inhabitants are highly dependent on agriculture as their main source of livelihood. There is a very close interaction between livestock and humans making the population in this area highly exposed to a number of neglected zoonotic diseases. The project study approach involves random recruitment of several homesteads, getting blood and faecal samples from livestock; cattle, pigs and goats, humans and other animals. We run several tests on these samples to investigate parasites infection and later provide any necessary treatment and health education. Worm infestation has been the most common diagnosis made out of the samples collected from our study subjects. Although the most common worms detected have been hookworms and roundworms, we have come across cases of zoonotic tapeworm infestation. The picture on the right below displays a tapeworm passed from one of the study subjects after treatment. The common cause of tapeworm infestation is through ingestion of raw or undercooked meat. People do no understand the link between undercooked meat and the infection with the worms. Improper hygiene could also predispose them to such infestations, especially pork tapeworm. Contrary to our expectation s, it was interesting that these study subjects did not show any clinical symptoms, one of them was in fact a vegetarian! Tests run on faecal samples from the rest of the household participants who ate meat did not reveal these parasites. We also found out that most people in the region did not cook pork long enough, they just shallow fry it and voila it’s ready! To be sure of having destroyed the larva in meat, I would recommend that pork meat be boiled for at least half an hour before frying, with this, we are sure the pathogens are destroyed. Tapeworm is an oral-faecal type of worm infestation of the digestive tract by adult parasitic flatworms called cestodes. The live larval forms are sometimes ingested by consuming undercooked food. At this stage, the larvae may cause symptoms in an intermediate host like cattle. 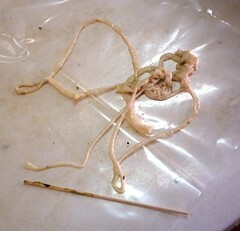 The most common types of tapeworms are: Pork tapeworm [Taenia solium]; Beef tapeworm [Taenia saginata]; Fish tapeworm [Diphyllobothrium spp]; and Dwarf tapeworm [Hyminolepsis spp]. In Busia, the first two are the most prevalent. Once infected, one will complain of; upper abdominal discomfort, diarrhoea, reduced appetite, anemia and passing of worm segments in stools. Apart from ingestion of raw or undercooked meat, improper hygiene, for instance when one ingests water or soil contaminated with human or animal faeces that contains pork tapeworm segments and eggs can also cause infestation. Each segment carries thousands of eggs. Cattle or pigs can also ingest the contaminated soil or water. Once ingested, the eggs mature into larvae that migrate to tissues i.e. muscles, lungs, liver and form cysts causing a condition called Cysticercosis. If a person ingests undercooked meat with the larval form of tapeworm cysts, an adult worm may develop in the intestine up to a maximum length of 15 meters and can survive to 20 years. Tapeworms are identified by presence of four suckers on their head [scolex]. Treatment is oral; a single dose of Niclosamide or Praziquantel or Albendazole is enough. Prognosis is always good with treatment. The PAZ project has made great progress in creating awareness of zoonotic diseases and treating tropical parasitic infections in Busia. However, more still needs to be done to further improve the awareness levels of these diseases not only in Busia but other areas in the country. In addition, more investment should be channeled to the preventive and curative measures. Lorren Alumasa is a Clinical Technician with the PAZ project, her area of specialization is in management of humans where she examines, samples, diagnoses and treats human participants in the project. 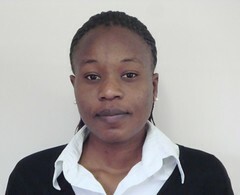 She has interests in understanding the distribution and prevalence of zoonoses in Western Kenya, best ways to eradicate the same in the region and eventually the entire Country. She is keen to see the study participants gain a better understanding and awareness of zoonoses and other related medical conditions that will translate to their better well being.